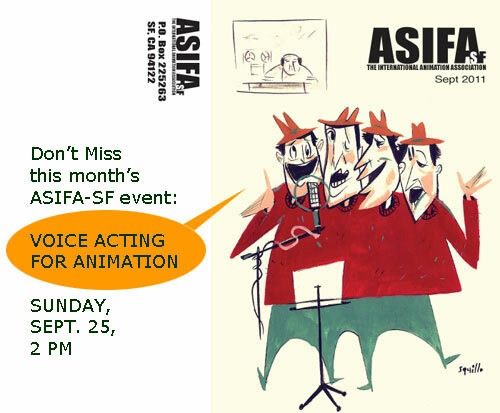 By this time, members of ASIFA-SF (and that group includes folks all around the globe!) should have received the latest edition of our mostly-monthly publication. And as usual, it’s chock-a-block with local and national news, profiles, analysis, reviews and opinion, collected and edited by our president Karl Cohen (not to mention another cool cover illo by Ric of Squillo Studios). Going forward, we’d like to encourage readers to talk back about what’s covered in the newsletter. For instance, there’s a long piece in this issue about the impact of marketing and merchandising on Pixar films (the unfortunate example of Cars 2 shows that it’s less a film than a toy commercial). And the ongoing controversy surrounding for-profit schools misleading students hoping for a career in the arts gets further coverage as well. Would you care to chime in? Then just click on the “leave a comment” link below and let us hear what you have to say! How can I share an event with ASIFA-SF? Can you post this on your blog?